Everybody deserves to have a voice. It’s a basic human right that should be available to everyone regardless of their background or physical ability. It’s something we can take for granted without even a second thought. Unfortunately, there are a number of conditions that can arise, whether from birth or otherwise, that limit a person’s ability to speak. Some of these conditions, such as cerebral palsy, can also limit a person’s ability to move their hands, making it difficult for common speech solutions such as sign language to be a viable option. Cerebral palsy, for example, affects between 1.5 to 4 per 1000 child births, according to studies around the world. Thankfully there are technologies available that aim to give those with speech impediments the ability to speak with minimal effort. Enter Tobii, a company that produces eye-tracking technology that uses both hardware and software to allow anyone with a speech impediment to communicate quickly and effectively. Eye-tracking technology allows a person to control a computer using only their eyes – they can do anything from browsing the web to even playing complex video games such as Assassin’s Creed (which was the original purpose of the Tobii company). The speech therapy software that Tobii has created, Dynavox, presents an easy to use, structured interface of words and actions to choose from. Its layout is also purposefully designed to not only give the user a voice, but to make learning how to structure sentences and communicate effectively simple. Eye-tracking technology makes this possible by observing what icon the user is looking at, pronouncing the word(s) and adding them to a speech box which, when activated, reads the completed sentence out loud. No other input is required from the user. 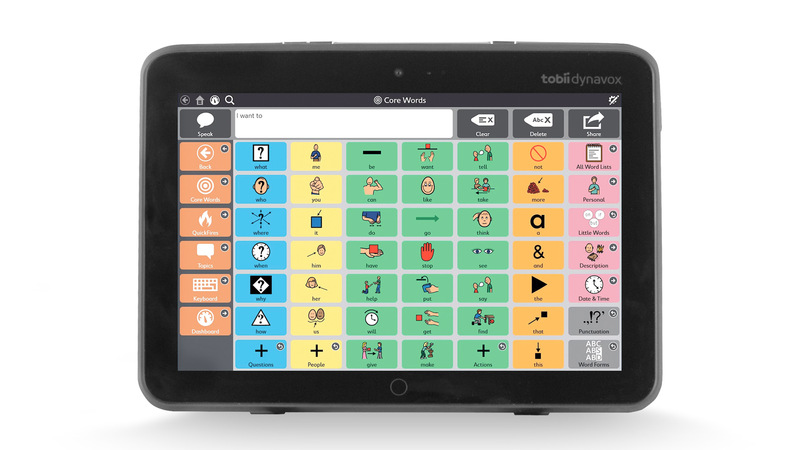 The Tobii Dynavox speech therapy software at a glance. (Photo courtesy of Tobii). This all sounds great, but there still exists a need for someone to bridge the gap between the production line and the end user, those who are truly in need of aid. 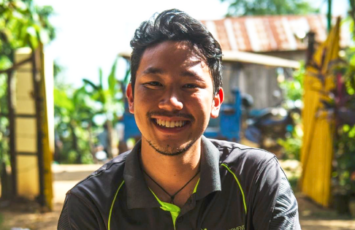 The technology can also be quite expensive and out of reach for many, particularly for those in developing countries such as India. Should this kind of assistance be unattainable for someone simply because they can’t afford it? Of course not. That’s where organisations such as Shishur Sevay and the ideal of inclusive education come in. 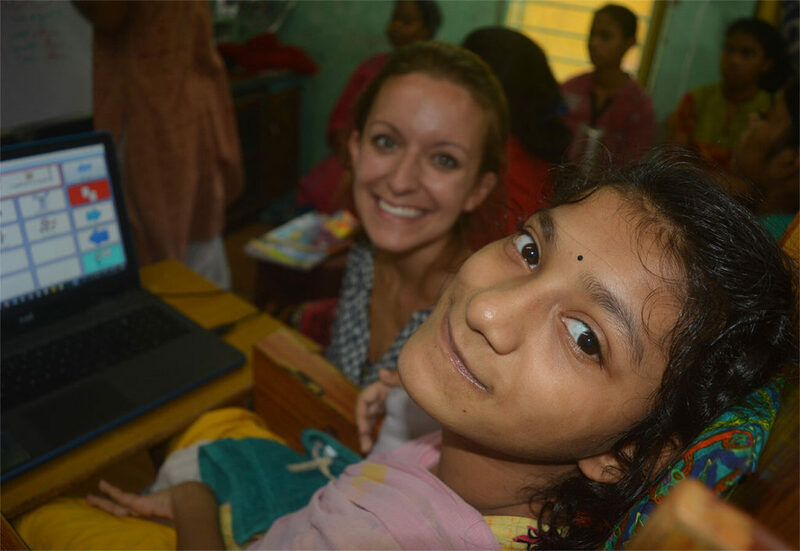 Shishur Sevay, based in Kolkata, India, was founded by Dr. Michelle Harrison, and houses 15 “un-adoptable” girls who were otherwise destined for a poor existence. Two of the girls have cerebral palsy, with no way to communicate. This prompted Dr. Harrison to seek out a solution, a search which led her to the Tobii Dynavox product. But she needed an expert to help implement the software and incorporate it into a more comprehensive speech therapy program at the school. Development Together was introduced to Dr. Harrison via Ms. Nicky Hurwitz, a Speech Pathologist from Perth, Western Australia, who was a supervisor for a group of health science students sent to India by the Curtin University and their Go Global program. Shortly after, Development Together forged a partnership with Shishur Sevay. Soon after that Ms. Emily Goulet, a Canadian speech therapist with extensive training in the Dynavox software, offered to volunteer her time and expertise with the children at Shishur Sevay. The experience was a resounding success, garnering the attention and support of the local community. Emily Goulet using Tobii Dyanvox to aid speech therapy with students at Shishur Sevay. Development Together aims to send at least four professional or university student participants to Shishur Sevay for volunteer/work experience every year: a marketing volunteer to help with fundraising and public awareness; a teaching/education volunteer to assist with classroom education and local teacher up-skilling; a speech pathologist/therapist volunteer to assist with speech therapy and Dynavox training for local staff; and a business/commerce volunteer to help with clerical duties, generating reports and up-skilling local staff. Check out our destination page to see how you can get involved with this amazing training program! Images courtesy of Ms Michelle Harrison and Ms Emily Goulet. Copyright 2018.